Just want to shared my new bought curtains. This is the best curtains that I have brought since I moved here in the USA. Didn't bothered to tell my husband about the plan as he'll just contradict everything. I do love it. By the way, I'm making this post while I'm on training in Advantage... Nothing much to do.. so I asked our trainer if I can go and he permitted me so here I am..
may paka novs naay curtain kami wla gyud!! hahhaha.. unsa d i na emo training ? red gyd kaayo hehehhe nindot. 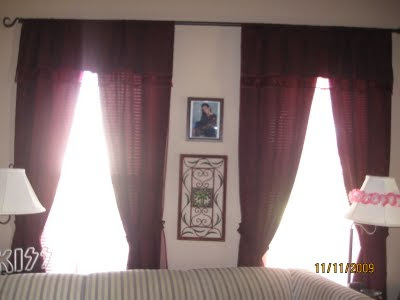 i looking for a new curtain sad mare for my newly renovated house ba. unya wa pa ko kakita oi. ayo pa ka nakapalit na ka.miss you so much sis. hows my inaanak na? nice, i love the color it's my fave.